With all the different products you need to stock and ecommerce needs you’re expected to handle, it’s no surprise when a warehouse starts to run out of room. But what’s just as common, but still surprising, is when warehouses have excess, unused space to work with. Due to a number of factors, a lot of warehouses can find themselves stuck with empty space that they’re unable to use as effectively as they’d like, and as a result it goes unused. Hitting a little close to home? In this article, we’ll explore a few common reasons for unused warehouse space and what you can do to prevent anything from going to waste. The Cause: Vertical room is one of the most contentious areas in warehousing. A lot of warehouses try to keep items as easy to access as possible by keeping them lower to the ground and ready to retrieve from warehouse shelves, but in doing so they find themselves needing to use up more floor space and installing shelves throughout the warehouse. The Solution: By going taller with all your shelves, you can free up a lot of room elsewhere in the building and make things a little more efficient. This does require a bit of planning and foresight—while you obviously want to keep your best-selling or most frequently-needed items on the bottom shelves where your workers can most easily get to them, you’ll want to take time and figure out what can go on the higher shelves—backstock, overstock, clearanced items, seasonal goods that won’t move too quickly in the coming months, and anything due to be shipped back to the manufacturer are all prime candidates for this shelving method. The Cause: Similarly, there’s a lot of areas that could be turned into easy storage space simply by looking up. Most areas have ample vertical space that isn’t being used for storage simply because it isn’t too close to your current pallet racks or shelving, but can work very well as extra storage when needed. The Solution: Look up into areas that have a lot of vertical space and aren’t already being used to store something. For example, a lot of warehouses turn to installing very tall pallet racks or shelving over the docking bay doors to their shipping/receiving areas and using it for overflow storage of items they don’t need to pick as often. Similarly, warehouse mezzanines allow you to add extra floor space up above the rest of the warehouse for items that don’t easily fit elsewhere, all while barely impacting the floorspace you already have. The Cause: Of course, if you haven’t started compacting your items vertically yet, you might also find yourself overdoing it with shelves. 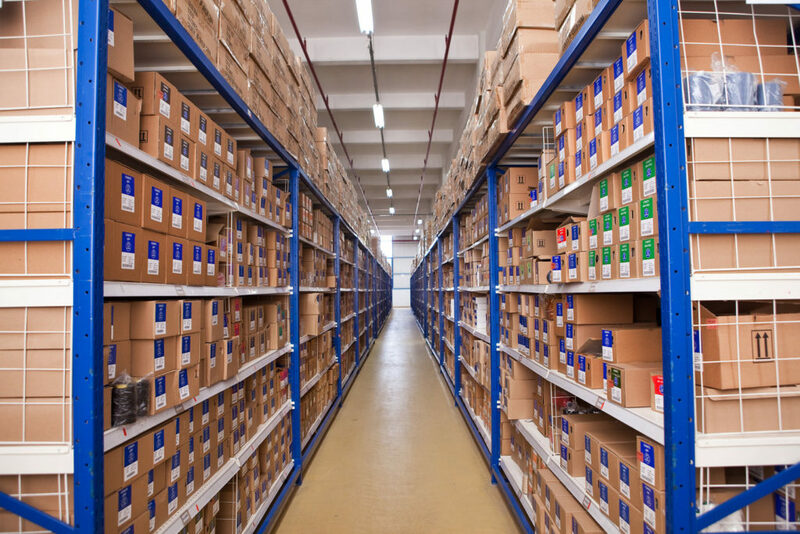 A lot of warehouses, when faced with an excess of inventory, will find themselves turning to extra shelves as the solution. However, if the influx of inventory doesn’t exactly catch up with the addition of new shelves, you could find yourself with empty shelves and small pockets of wasted space. The Solution: Careful redistribution of inventory can help you better understand what needs to go where, and for how long. Frequent inventory cycles based on popularity of item, current demand, seasonality, and other contributing factors can help you move your items around based upon their need. Once you have a plan on how to relocate your inventory based on need, you should find yourself with much less empty space on your shelves. The Cause: Understandably, finding the right balance in aisle width can be tricky. There’s always federal and local safety standards to consider, and you need to make sure the aisles are wide enough for everyone to travel efficiently and safely to their destination. However, there’s a balance to be struck, and in a lot of cases making your aisles too wide can reduce your overall usable floor space and stop you from bringing in the shelving or installations you need to store everything you carry. The Solution: In many cases, your aisle widths can be reduced without impacting safety or travel. Aisle widths should always be dictated by the sort of trucks you use (forklifts, etc) and the widths of the pallets you keep items on, but you may have room to make changes. Assess your current aisleways to see if you have pathways you can narrow; for example, areas with primarily foot traffic and less need for trucks and heavy equipment. The Cause: In a lot of cases, the location of your products is simply being misused and leaving gaps in your pallet racks or causing space to go unfilled due to awkward packaging and pallet sizes. The Solution: It may require a lot of math and a lot of pallet shuffling, but there’s a lot of value in making sure your pallet slots are optimized properly and not leaving any excess, awkward space. Check to make sure all of your pallets are a uniform size and are always stored with the exact same gaps in between them to reduce wasted space and ideally give you more room for palletized goods overall.